You may think that jumping into a cool water pool is living on the edge, but after catching a cold, you realize that there are other funnier ways to live in the moment. Having a swimming pool with nice, warm water is nice, but it also costs you an arm and a leg, which makes you really consider to the alternatives. The easiest way that comes to mind. Get a solar pool cover that is able to do an amazing job when it comes to heating up the water in the pool. A solar pool cover minimizes evaporation and insulates the pool from cool air. It does this at the same time with trapping inside the pool heat from the sun, which makes it efficient for heating up your swimming pool. Keep in mind the evaporation is the most important one cause to blame when it comes to heat loss. The diversity of solar pool covers is quite impressive and you can get pool rings, liquid solar covers- whatever fits you the most. They differ by size, thickness and you need to get the right measurements for the widest and longest parts of your pool in order to get the right solar pool cover. If your pool has a one-of-a-kind shape, don’t despair! You may also trim a solar blanket so that is fits perfectly to your swimming pool. The most popular choice out there is the solar pool blanket (bubble side down) that is fitted to the exact shape of your in ground and above ground pool, floating on the water when you’re not using the pool. Apart from the fact the solar pool cover aren’t that expensive (especially when you check your electricity bills), the solar pool covers are also great because they may raise water temperature by 15 degrees or even more. Furthermore, a solar pool cover may even help you get a smaller heater for the pool (why not go for a solar heater also?) and even lose the heater entirely. 1). 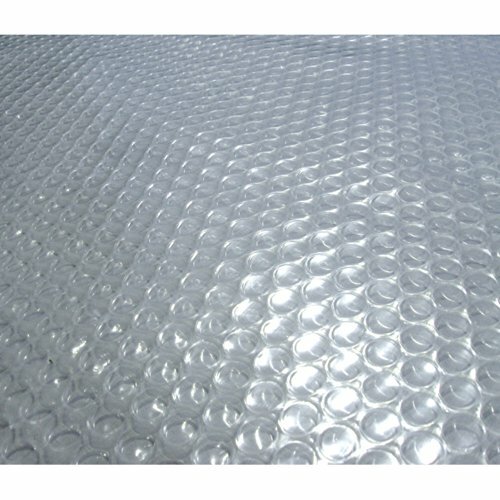 The clear Sun2Solar Clear Rectangular 4-Foot-by-8-Foot 16 Mil Swimming Pool Solar Cover is made from a film of thousands of small bubbles. The solar pool cover is very efficient when it comes to minimizing evaporation and retaining heat inside your pool at the same time. As it’s all clear, the cover lets the sun’s UV rays get deeper into your pool, warming it up easier and faster. Not only it warms your pool, but the solar pool cover also lowers water evaporation by 95%. It keeps your swimming pool nice and clean also, protecting it from dirt and debris. 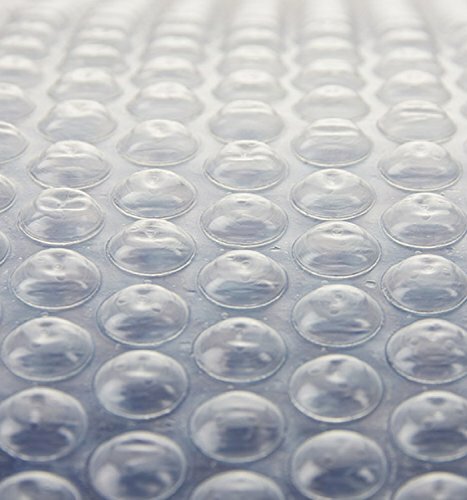 The cover is easy to put on/take off and you may easily roll it over when not in use. Pay attention when putting it on, as you need the bubbles to face down to the water, tracing a line on the cover if you need to adjust its size. It’s easier like this to trim the additional material. The solar pool cover is made with resin material and leaves a durability feel. It’s well made and it may serve you for quite some time. The material is good quality and holds up the intense use. 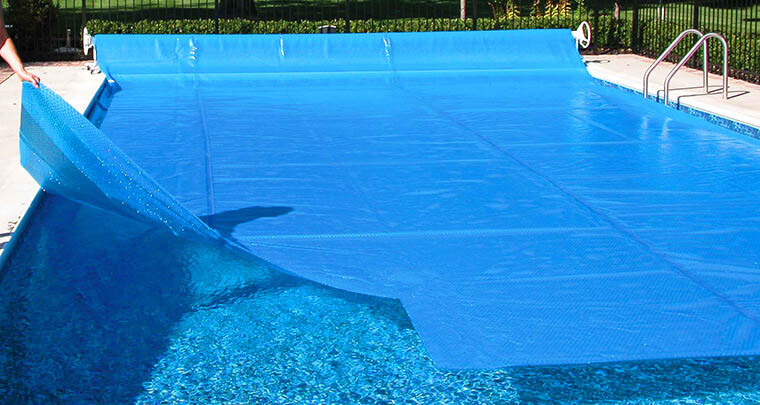 The cover lies perfectly flat and heavy on your swimming pool. Additionally, its clear color makes it so nice to watch at dawn. Nevertheless, for a good price you get an efficient, dependable solar pool cover that may serve you well for quite some time. 2). 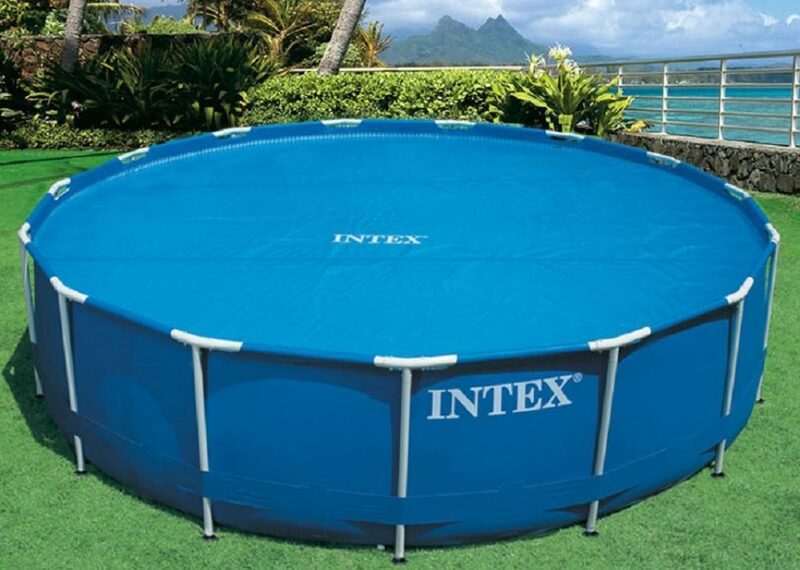 Easy to set it up and to take it down, the Intex Solar Cover for 15ft Diameter Easy Set and Frame Pools does exactly what you’d want from a solar pool cover: keep your swimming pool clean and warm. The cover fits perfectly a 10-foot round pool and it’s made to lower evaporation by 95%. It traps heat inside and minimizes your costs, giving you a nice, clean and warm water to swim into every time. You simply lay it on your swimming pool as it fits inside edge of the pool. The solar pool cover floats in place, doing its job. Not only the cover warms up the water, but it also keeps at distance debris and dirt, giving you a nice, clean swimming pool. It collects efficiently the sun’s energy and traps it inside the water, minimizing heat loss. The solar pool cover is lightweight and comes with a functional carry bag, for increased portability and easier storage. Despite its lightweight, the cover stays in place and doesn’t shift around even on severe wind. All in all, for its efficiency and ease of use, the solar pool cover is a reliable option to have in mind when in need. 3). The main reason for you when getting a solar pool cover is not only to keep the water nice and warm, but to also warm it up. The Blue Wave 15-Feet Round Solar Blanket for Above Ground Pools 12-mil does its job very well when it comes to that, even though it comes with some strings attached. The clear blanket lets sun’s rays get deeper into your pool, raising the water’s temperature. 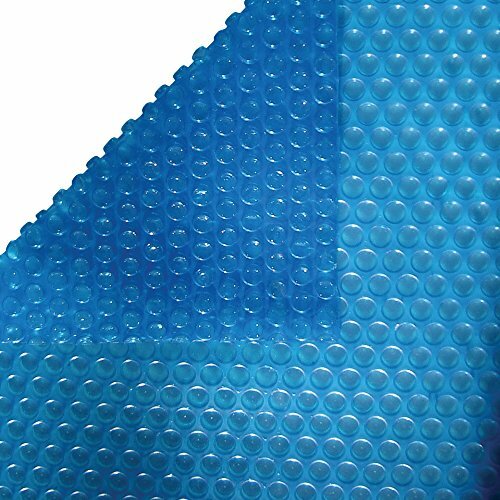 The blanket is made with heat-retaining thermal bubbles, which increase its efficiency for raising the temperature in your swimming pool. The air bubbles create an insulating layer, protecting your pool from cool winds and night lower temperatures. The materials is 12-gauge thick so it’s quite thick, taking the use for a long time. The solar blanket warms up your swimming pool rather fast and keeps it that way for a good amount of time. It’s easy to put it on and take it off. It’s not difficult to roll it over for storage either. As it comes with its own storage bag, the solar pool cover isn’t just easy to carry around, but also to store it, for longer life span. Thick enough and sturdy, the solar pool cover is a dependable choice to try. No matter how we put it though, for its efficiency and reliability, we’d have this on the list anytime when in need for a good solar pool cover. 4). Most of the solar pool covers these days are thin, which doesn’t make them less efficient, but puts a big question mark on their durability. Thick and made to last longer than most covers out there, the Harris 18 ft. x 36 ft. Rectangle Solar Cover is not only able to warm up your swimming pool, but also to take the use for more than just one summer. The solar pool cover is made to raise the pool temperature even with 15 degrees and it does a good job on minimizing water evaporation as well. It keeps its flexibility for quite some time and doesn’t get brittle like a dark colored blanket would. It lets the UV rays go deep into your swimming pool, warming it up for nicer swimming. As for the protection against dirt or debris, the solar cover is also reliable as it seals your pool just right. It minimizes risks for the chemicals to deplete due to exposure, making the swimming pool a safer place. The solar pool cover is a heavy-duty option and leaves a durability feel. It’s thicker than you’d expect and sits on the heavy weight side. It’s big and efficient on all levels. It’s easy to install it, even though you may need a bit of help. It’s build to last for several years, taking the rolling up rather well, with minimal wear. The minor flaws don’t make us change our mind though and we still consider the solar pool cover to be a reliable, long lasting option to warm up and protect your swimming pool. 5). 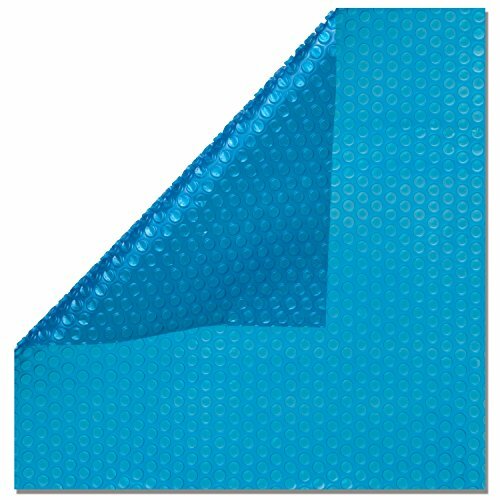 True to size and reliable for a couple of years, the 12 Mil 24 x 44 ft. Rectangle Swimming Pool Solar Blanket Cover is one big solar pool cover that does a good job on your swimming pool. The cover is 12-mil thick and it’s made with UV-stabilized resin. There are thousands of small air bubbles that help the solar heat go into your pool, increasing its temperature. Lowering the chemical loss through evaporation, the solar pool cover means a lot of deal for your budget as you don’t spend any more money nor time on chemicals or rebalancing your pool. Even though it runs true to size, you may easily cut or trim the cover in case you have a kidney/irregular/oval pool. The solar pool cover also protects your swimming pool from leaves, dirt or bugs, keeping it nice and cleaner for longer time. The pool cover is well made and seems to last for more than just a couple of years seems. Big and thick, the cover isn’t that easy to install on your own and you may need a friend or a reel for faster and easier installation. For the reliability and efficiency, the solar pool cover may be your solution for a couple of years.